One of our favorite kitchen renos to date was in the Westlake area. 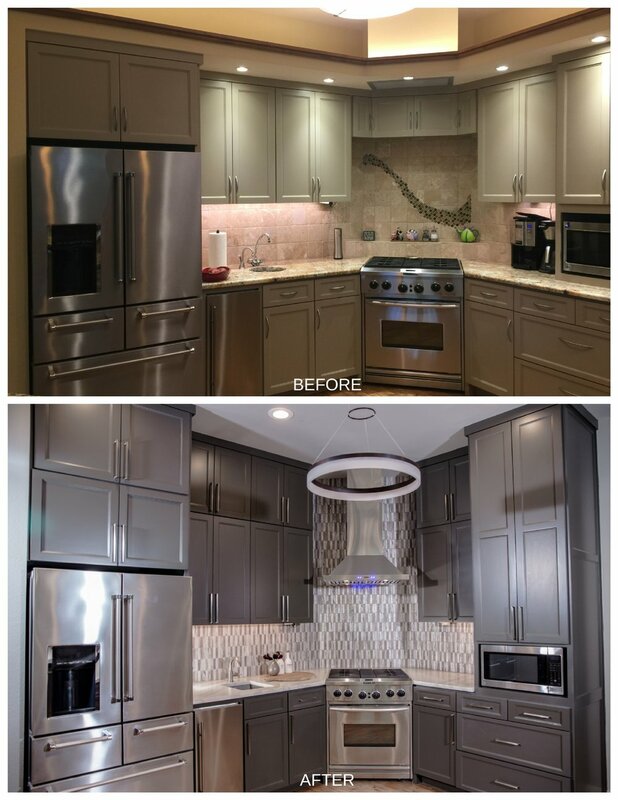 Our client bought the house about a year ago and knew from the beginning that she wanted to redo the kitchen. However, she first started with her fireplace and bathroom. When she was ready to get to the kitchen she hired Allison Jaffe Interior Design LLC who brought Skelly Home Renovation into the project for the construction. Allison and the homeowner finalized the design plan prior to the work beginning as well as making all of the material selections. When demo day began it was smooth sailing from there, a contractors dream! :) The client’s #1 problem was one that so many of us can relate to: STORAGE. She was looking to create more storage in her kitchen. Her kitchen wasn’t well laid out. She had a shelf system above her existing cabinetry and she had a double layer island; neither feature was very functional or useful to the space. To create more storage space Allison's design plan included removing the shelf system above the upper cabinetry. Our talented cabinet builder was able to create upper custom cabinetry that mimicked the existing lower cabinetry. Shelf system in the previous picture completely removed and cabinetry/storage extended all the way up to the ceiling. The island dilemma (solved by Allison Jaffe Interior Design LLC) was to lower the island to one height. Now, the island is two full slabs of quartz.—i.e. REALLY BIG, which is great for spreading out, doing homework, setting down appetizers and much more in the kitchen area. The island was finished out with beautiful tile on the back, making that area much more durable. The island has a slate 12 x 24 tile installed with a mitered edge so that you don’t see the seam. Isn’t it beautiful? Some other features that were selected by Allison Jaffe Interior Design LLC and executed by Skelly Home Renovation are listed below. HARDWARE: All the hardware in this kitchen was updated. We filled the holes from the previous 3 inch hardware that is difficult to grab and changed each to 5+ inch hardware, which is much easier and practical to use. LIGHTING: Recessed cans and pendants were added to brighten up the space. Added bonus: all of the lights in this kitchen are on dimmer switches and are AV controlled lights that can be controlled on a phone. ELECTRICAL: All of the outlets were relocated to be hidden under the cabinets, so they don’t interfere with the beautiful pattern of the fun glass mosaic backsplash. A new vent hood was added to this kitchen, as well as an air switch for the garbage disposal. 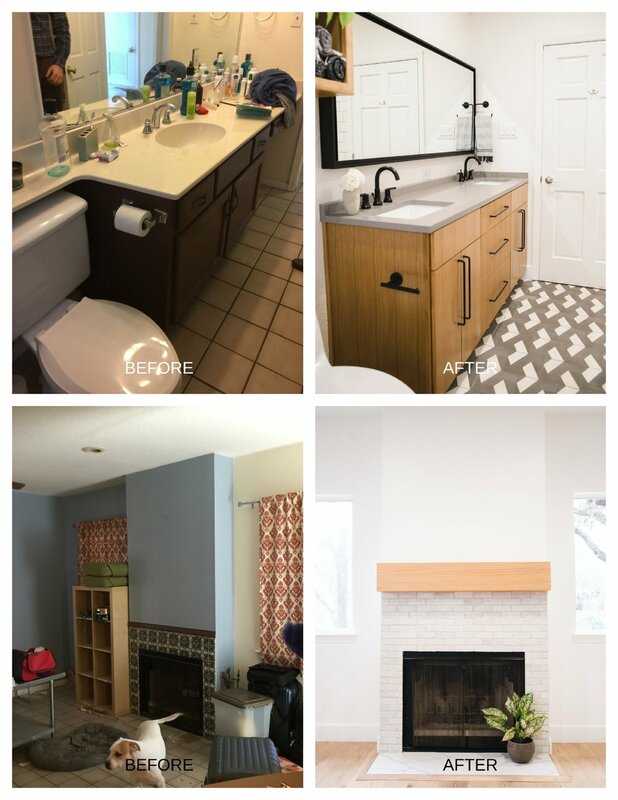 PLUMBING: a new sink, new plumbing fixtures, a new bar sink, an Instant Pot hot water sink near the stove, and a new faucet were all installed in this kitchen. PAINTING: the whole kitchen, as well as additional areas of the house, were repainted from a yellowy/taupe color to a light gray color that Allison selected. The timeline for this project was 5 weeks. We finished on time and came in right on budget ($50-$55k). This project was very smooth with many pre-conversations + during with both Allison Jaffe, the designer, and the client. The BEST part of this reno (other than more storage and much happier lighting)---is that it is a good example of how Allison incorporated existing materials into the design plan like the flooring and the lower cabinetry. Would you like to see more of this project? Head over to the portfolio page to see more images! I cannot reiterate enough the importance of clients (YOU) looking at samples IN PERSON, not through emails, photos or text. When you decide on samples virtually, they just don’t have the same effect online and the colors can look off when you get them into your home. I’m pretty positive all designers would agree with this, but I think contractors sometimes are so caught up with installing the project pieces that we also need to remember the end result: a satisfied customer who is pleased with how all the materials work together to make a beautiful new space. Please. Save yourself a catastrophe. Make sure you see the samples in person before you order them. Any company that is worth using will let you sample products in your home for a few days. When you get the sample, touch it! Imagine how it will feel to use it in the space. Stare at it for multiple days at a time. Don’t rush this process; you want to make sure that you like it. If applicable, have your dogs walk on it, kids walk on it, etc. Put the sample next to all your other materials/samples in that area. Keep the sample at home for a while and just stare at the sample and its surroundings in all different kinds of light (seriously!). This is the trial time that can make or break your satisfaction level of your renovation. Another idea is to take a picture of the sample and then make multiple copies of that picture to place all around the space you are looking to renovate. I recently did this with a patterned tile floor sample. I made multiple copies of that floor sample and then placed the tile pattern around on my floor just to make sure that I like the look of the overall pattern. Take time to sample. This sounds like such a simple request. But renovations are emotional, and many items can pop up (renovation or non-renovation related) that collide with you not being able to use your kitchen for 2 months! So, choosing your materials while you are getting enough sleep and can take your time to really consider them is majorly important. Quick tip: Having your dogs walk on your flooring samples may sound crazy but it’s not. Dogs have nails (I know, pretty obvious! ), and with soft species of wood they can scratch your floors before they are even entirely installed. Wood is expensive, so don’t make this mistake! If you do have dogs and want hardwood, I recommend you look at engineered hardwood samples that are more durable and already have some character/markings built into them. There are certain things to look for while interviewing contractors, besides the obvious referrals, website, qualifications and quality of work. I’ve listed a set of questions below that you should ask yourself after your initial walk-through. Are they on time? If they are not, did they call or email you beforehand and let you know why they will be late and when they will arrive? There are things that come up; we do deal with emergencies, but the potential client should be aware. No one likes to wait, and I for one HATE being late. I will always communicate with the client if I am late for any reason. Did they bring a Ipad/pad of paper; are they taking notes? Are they taking photos? Did they ask you first if they could take photos? Are they taking measurements? I hear this over and over again that contractors don’t take measurements. How can you price out materials and labor accurately if you don’t gather measurements?… beats me. I even confirm measurements from architect or designer plans, just to make sure that we are all operating from and ordering materials off of the same page of measurements. Did they leave a business card for questions you may think of afterwards? What is your lead time for this type of job? How long do you anticipate this project to take? Will I be assigned a specific project manager? How often will the project manager be checking on the job? How many projects will this person have in addition to mine? How do you find and vet your subs? Do you have experience with this type of renovation? What are your thoughts on these materials? What if I want to increase the scope of the project later? What is your process for that? "Is there more hiding beneath the surface?" Below are some domino effects to think about when moving forward with a remodel. The list is not intended to discourage you to move forward, but rather to serve as a list of things that could be found so that you can feel prepared about possible pitfalls along the way. Knowing this now may lessen the blow when/if these problems are found in your renovation. Just know you are not alone; many people are experiencing these budget busters! A good tip is to always keep additional miscellaneous money set aside for these “not fun” items. Remember, a well estimated renovation proposal (that includes miscellaneous expenditures for potential pitfalls) is often better than just looking at cheapest renovation number that comes in. I think you get the gist! The list could go on, but I will stop it there for now. One final thought: a good contractor will present you not only with the problem but also with a workable solution. There are always multiple solutions, and usually a variety of price points, so don’t you worry! Just keep the big picture in mind as you deal with these unexpected snags along the way. In the end, it is better to do a quality, safe renovation that will last for years to come than to patch up a problem temporarily. Ignoring problems now in order to stay on budget may be much more hazardous to both your safety and your finances in the long run. Today I want to share a project with you that was a true labor of love. My initial meeting with the client was about a year ago. At that point tenants and animals had been living in the client's house for years, & it was wrecked. The drywall was ruined; the landscaping was out of control; the shower upstairs was inoperable, and the whole house needed serious TLC! However, the second I walked into the house, I saw great potential and was excited to have been given the opportunity to transform the space. I knew we could make the house beautiful once again. Once we got started on the project, the clients, who live in California, gave us free reign on design and construction. This allowed for a truly dramatic transformation, and for the timeline to continue to move forward quickly. We updated them with photos, emails and phone calls each week until the last month. The clients flew in for the grand reveal at which point they had not seen photos for a month. They were blown away and absolutely loved the final product! The budget for this whole house renovation was $150k & the timeline was 4 months. It also required obtaining permits from the city, which is no small feat in Austin, TX! It is really hard to choose my favorite part of this renovation! There is so much loveliness in this house. The lighting is fantastic. We added over 20 lights, brightening the space even on a rainy day. Custom cabinetry throughout adds to the charm of the house. Each space in the house has a different palette, but flows very naturally together. Every room is a bit of a surprise. One of the most important changes we made was removing the pantry which separated the kitchen between the living room. This added so much value to the house and allowed us to create an open concept that is felt from the minute you walk in the door. The kitchen underwent several transformations to make it warm and inviting. In addition to relocating the pantry and opening up the space into the dining room, a chestnut beam and white oak engineered hardwood provide warmth and contrast. Stainless appliances, kitchen paint grade cabinets (we used Gravel by Restoration Hardware), a single basin porcelain under mount sink, vertical shiplap backsplash (painted Right White by Restoration Hardware), can lighting, and a quartz waterfall counter top give this kitchen an organic, fresh, modern look. I love all the organic elements throughout the house. We used many different wood species throughout the house to ensure it was modern but also to make it feel warm, cozy and like you would want to live there. We used: walnut, white oak, pecan and cedar. Natural wood is timeless! (PICTURED ABOVE): We gave this bathroom a fresh new look with white oak custom cabinetry, black hardware, a caesarstone concrete countertop, and a cle tile floor. (PICTURED BELOW): A clay tile surround, an added mantle, and Right White Paint by Restoration Hardware gave this family room a fresh, clean updated look. Lots of natural light combined with over 20 added lights brighten this space and provide a cheerful, modern palette. Following the renovation, the house was listed. We knew from the beginning that balancing an investment property with the area (Travis Heights) was important. Presenting a quality product with intentional design and functional features was always at the forefront of our minds. If a house is renovated that will soon be for sale, it cannot be too personalized. However, adding small touches to create a unique space also attracts buyers. We were very aware of these facts from demo to completion. The end result is magnificent and one of our favorite projects to date! Upper Left: We modernized the stairs by adding an unusual touch: wallpaper! This material is Blue Marble wallpaper for Beginners & can be found at Etsy.com. Upper Right: Try vertical shiplap as a backsplash in your kitchen for a fun, modern twist. Lower Left: This upstairs bath went from drab to fabulous when we added custom walnut cabinetry, a herringbone gray tile floor, brass fixtures and quartz countertops. Lower Right: This marble shower has a beautiful hexagon pattern marble floor, a rain shower head, brass fixtures, & a frameless shower door, making it both a functional and beautiful space to get ready in the morning. To see even more pictures of the finished project, click below! Renovating your home can be one of the most exciting and gratifying experiences of home ownership. From designing the floor plan, to purchasing materials, there is lots of fun to be had and most clients cannot wait to begin construction. However, choosing to live through a renovation is a big decision that should not be taken lightly. Once ground breaks, you are living in a full blown construction zone. This means constant noise, mess, and workers in your home. That being said, there are some positives. It is easier to monitor day to day work and to notice small imperfections when you see the home daily. It’s easy to communicate with the contractor on a regular basis when you see them at the home. Renting a second home is costly. With additions to the scope of work and surprises, you can get into trouble if you plan for a 6 week rental and your timeline doubles. Be sure to consider unforeseen timeline delays when making your decision to move out or stay put. Homeowners who decide to move into temporary homes also need to factor in additional housing expenses above and beyond the cost of remodeling. Having a second home doubles more costs that just your mortgage. Be sure to consider two sets of utility bills as well. If you decide to stay in your home, be sure to have your contractor set up at least one sealed-off, construction-free zone and make it your go-to place to escape the chaos. Renovations are invasive and you will want to get away. In order to minimize health-related problems, make sure to pack up clothing and bedding that you won’t be using in space-saving, vacuum-sealed bags to keep them clean and dust-free. Cover ducts with plastic. And turn off air conditioning and heating systems during the day, if possible, to keep air from circulating through the house. Maintaining a somewhat clean home during a renovation is very important. You should insist that contractors clean their workspace at the end of each day and haul away trash daily. Ultimately, the truth is that living in a construction zone for an extended period of time is grueling. If it becomes too much to bear, you may consider a short getaway or renting a hotel for a week in the middle of the project. Living through a renovation will save you money, but will undoubtedly be invasive, loud and noisy. Make sure to consider all the pros and cons before making the decision to stay or go. Finally, remember that all the sacrifice will be worth it for your beautiful, new, finished product! Are you thinking about renovating your home? Click here for a complimentary estimate on what it would take to get your dream project started!